A school of fishy friends that swim together and bring together everyone in friendship! They forcibly share their love and emotions with the mice they encounter, brainwashing them into friendship-sharing friends that in turn go on to share their feelings with other mice! Hopefully everyone will eventually be friends and live together happily ever after, or else!! The School of Friends Skin can be used on the School of Sharks weapon. The trap's stats (power, power bonus, attraction bonus, etc.) are not changed. 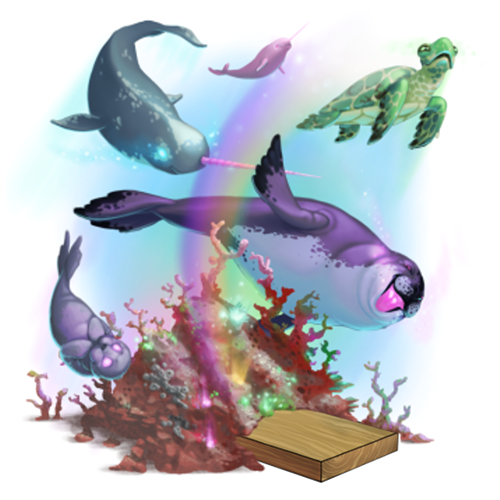 The School of Friends Skin can be purchased at the Sunken City Trapsmith for 790,000 gold, 250 Sand Dollars, 150 Barnacles, 150 Mouse Scales, and 150 Damaged Coral Fragments. It can be refunded at the same location for 140,000 gold. The School of Friends Skin can be traded on the Marketplace or through Give To Friends. 2 July 2014: The School of Friends Skin was released with the introduction of the Sunken City. This page was last edited on 9 December 2017, at 14:45.